Madonna's Confessions Tour has begun. The headline-grabber this time is her performance of Live To Tell, during which she wears a crown of thorns and appears crucified on a giant cross. Confessions concentrates primarily on her latest album; it doesn't even include the once-traditional Madonna tour encore, Holiday. The tour set list is: Future Lovers, Get Together, Like A Virgin, Jump, Live To Tell, Forbidden Love, Isaac, Sorry, I Love New York, Ray Of Light, Let It Will Be, Drowned World/Substitute For Love, Paradise (Not For Me), Music, Erotica, La Isla Bonita, Lucky Star, and Hung Up. An episode from the current season of South Park has been censored by Comedy Central in the US. The episode - Cartoon Wars II, broadcast on 12th April - was a comment on the American media's refusal to reproduce the Jyllands-Posten Mohammed caricatures. 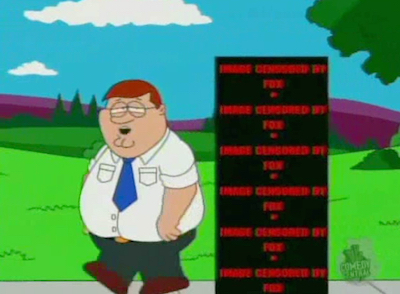 The short sequence featuring Mohammed was replaced by a black screen. Both this episode and the one preceding it (Cartoon Wars I, 5th April) also include parodic censorship of other Mohammed images. 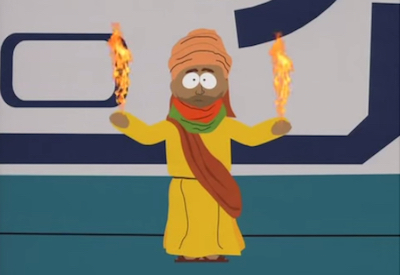 Ironically, however, Mohammed can be seen at the start of every episode in the 2006 season, as he appears in the opening titles sequence. Also, he appeared prominently in the 2002 season's opening titles and the episode Super Best Friends (4th July 2001), and these appearances are not censored when the episodes are repeated or syndicated. Also, last year the FX series 30 Days included a cartoon depiction of Mohammed, in its Muslims & America episode broadcast on 29th June 2005. 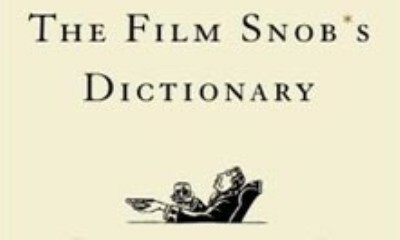 This little book (titled The Film Snob*s Dictionary, written with an asterisk instead of an apostrophe) is a crib-sheet for wannabe cineastes. But, while you could flick through this book and gain a basic knowledge of cult cinema, it's always better to actually watch the films themselves. The entries (by David Kamp and Lawrence Levi) are all slightly critical: mainstream films are derided as populist, and intellectual films are derided as elitist. It seems that there's an agenda to everything, with passion for cinema replaced by reservation and sometimes cynicism. The list of differences between 'films' and 'movies' is very funny, though. "A one-party election is not normal..."
The Thai Constitutional Court today announced that the 2nd April general election, won by Thai Rak Thai, was invalid. They decided that the Election Commissioners were biased in favour of TRT, and that new EC regulations regarding polling booths were illegal. For the general election, polling booths were repositioned, so that EC staff could watch people as they voted. The Constitutional Court has declared this a gross invasion of privacy, and scheduled a new general election for 15th October. Thaksin will remain caretaker Prime Minister until the election, but will resign once a new PM is chosen by the winning party. The Court's decision comes after the King made a rare public intervention in the political situation. In a speech to the Constitutional Court judges, he directly criticised the election, saying "A one-party election is not normal". For the past few months, anti-Thaksin protesters, who wear yellow to signify loyalty to the King, have called for a royally-appointed prime minister, citing article seven of the constitution. However, in his speech the King unequivocally dismissed any such proposal: "Article seven does not empower the King to make a unilateral decision. It talks about constitutional monarchy but does not give the King power to do anything he wants. If the King made a decision, he would overstep his duty and it would be undemocratic". 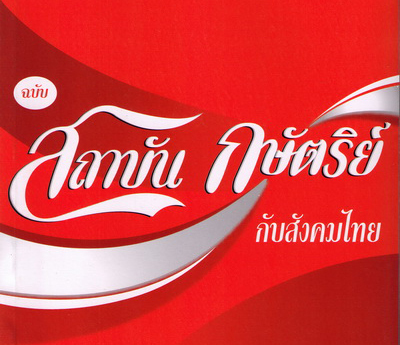 The October-December 2005 issue of Same Sky (volume 3, number 4), a radical left-wing Thai journal, has been banned. 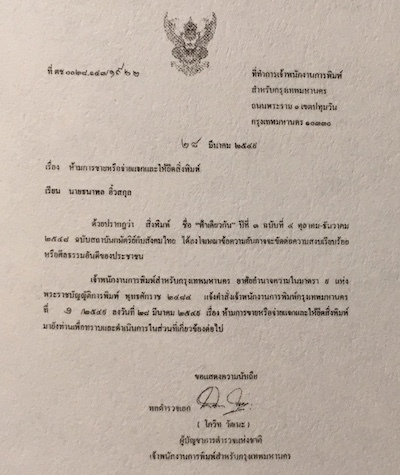 The editor has been contacted by the police, who claim that the magazine (specifically its interview with Sulak Sivaraksa, publisher of Seeds Of Peace) constitutes lèse-majesté. Last year, Same Sky distributed a VCD containing footage of the Tak Bai incident (volume 2, number 4). Seventy-eight Muslim protesters suffocated when they were packed into trucks by the military in Tak Bai, and VCDs featuring footage of the incident were banned by the government.